For years the company EREDI MATARAZZO SNC provides poles chestnut scortecciata for various uses: from engineering to naturalistic rustic fences, from the fences to structures for orchards and vineyards. Our technical department is at your disposal for any other information, or custom quote. The chestnut poles are used in various ways, thanks to their resistance to atmospheric agents. It is a type of "soft and flexible timber" that It does not damage the farmland. 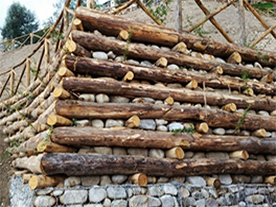 The timber, which is worked, growing between the stones of the Irpinia mountains; It grows more slowly and then with a different fiber more resistant to the elements. The company offers a fine wood, particularly durable and compact. The excellent stability in the soil, the elasticity and the high resistance to degradation natural and humidity make such timber the ideal material for the production Raw or partially peeled poles. We deal, usually, only partially peeled poles, but when also required to completely debarked poles. It is chestnut poles that are debarked and then be sold for any use. These poles come in our stores without any processing but at the "raw state", subsequently machined with a machine with which the chestnut poles are debarked partially. The knives are positioned in the slot of the "wheel". The pole chestnut flows along the horizontal axis attached to the wheel. This wheel turning at high speed allows debarking of the post. The waste product is expelled through a kind of "barrel" which is located above the wheel. On request it is also "palletised". Sizes meet every need of the customer data we can provide the pole in all dimensions required. On request we are sharp. It is chestnut poles used as a handrail in the fences. It is chestnut poles that after being partially peeled are passed into the fire. It is chestnut poles that after being partially debarked and the tip is immersed in the bitumen, as this tip is inserted into the ground by increasing the lasting of the pole. 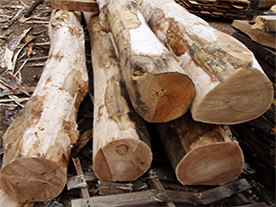 It is chestnut poles that we provide with bark and without any kind of treatment. It is in particular of the support beams. Round beams exclusively used for rustic environments. The use of the beams is essential in building, in order to impart stability to a structure. The beams are often left exposed, giving immediately rustic warmth. Such beams are also engaged for the construction of containment structures because of their versatility and resistance to atmospheric agents. It is a type of timber "soft and flexible" that does not damage the agricultural land.